The Red Cross War Memorial Children’s Hospital is located in Cape Town, South Africa. It is the largest specialist children’s hospital in southern Africa. The hospital is dedicated to providing world-class paediatric treatment, care, research, and specialist training. The Anesthetics Department has a special interest in Pain Management at the hospital and has established a Creative Arts Therapies Programme including Aromatherapy, Art Therapy, Music Therapy, Child Life Specialists, and Child and Family Psychotherapy. A volunteer Aromatherapist has been working at the hospital since 2004. Initially this service was only offered in the Burns Unit, but it has since expanded to include all the wards in the hospital. Medical or Allied Health Medical practitioners, including doctors, nurses, physiotherapists, occupational therapists, and social workers refer patients to the Creative Arts Therapies Team that they feel would benefit from this service. In 2008 the ‘M’ Technique became the basic method of administering essential oils to the patients during an Aromatherapy treatment. It was felt that traditional massage was too intense for these very fragile children and so this gentler technique is now used. The ‘M’ Technique is a method of light rhythmical stroking movements performed at a set speed and pressure that lulls the body into a very deep state of relaxation. This technique was created by Dr. Jane Buckle under clinical conditions while she was working as a nurse in an Intensive Care Unit (ICU). Currently there are five additional volunteers that have all been trained in the ‘M’ Technique working in the Oncology Ward, the Burns Unit and the Cardiac and Tracheotomy Wards. The original therapist works mainly in the ICU, but also sees referred patients in other wards. While it would be ideal to blend an essential oil mix for each individual child, this is impractical in the hospital setting, particularly as the therapists provide their own oils. A blend of German Chamomile (Matricaria recutita), Lavender (Lavandula angustifolia), and Neroli (Citrus aurantium var. amara) in a 1% dilution in Grapeseed (Vitis vinifera) oil was decided on as the most appropriate blend for the children being treated at the hospital. The emphasis on the treatment is to provide a calm healing space and to alleviate pain, stress, anxiety, and trauma that children experience while in the hospital. A body that is calm and relaxed is in a much better position to heal than one that is stressed and anxious. Case Study 1 (Phantom Limb Pain) The patient is a thirteen-year-old boy who touched a live electrical wire and was severely shocked and burnt. As a result of his injuries his left arm had to be amputated above the elbow. He also suffered full thickness burns on his chest and both feet. The first time that this young boy received an aromatherapy treatment, he was complaining of phantom limb pains in his left arm. The Aromatherapist asked him if he would like her to treat the amputated area and he said yes. At the time he was sitting in his wheelchair and his right arm was elevated in a splint so that his upper arm and elbow were horizontal to the ground with his forearm hanging down. The treatment was started on his right hand and forearm so that he could get the idea of what it felt like. The therapist then moved onto the left side. 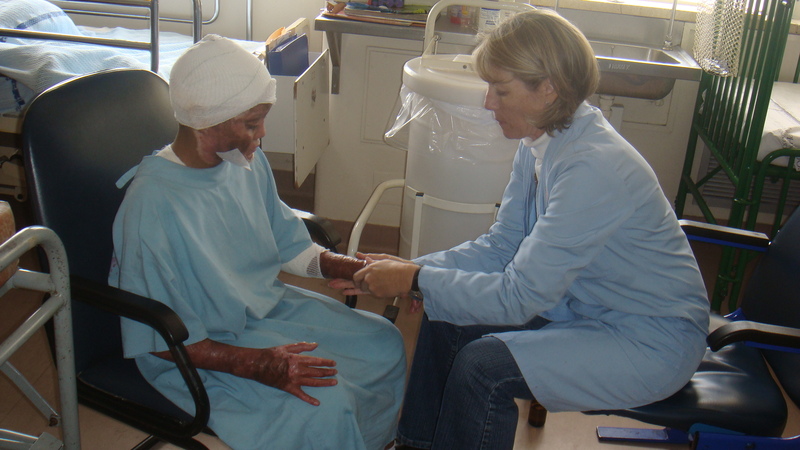 The treatment started with both of her hands lightly holding his upper arm just above the amputation. She then slowly stroked both hands down towards where his hand should be and asked him to tell her when she reached his fingers. It is well-known that when patients suffer phantom pains the missing limb often feels much shorter or longer than what it actually was (Nikolajsen and Jensen, 2001). For this young man the phantom hand was at the appropriate place. The therapist started off stroking her hands up towards his shoulder and then down towards his ‘hand’ ending the stroke with her hands over his ‘hand.’ She held his ‘hand’ with her hands and used her thumbs to do light stretches from the middle of his ‘hand’ to the sides. Each ‘finger’ was then treated with three circles over each joint and then a stroke to the ‘finger.’ The therapist explained to him which ‘finger’ she was working with and each time the corresponding finger on his right hand would move. He didn’t seem to be aware of this as he was watching her intently work on his left ‘hand’. She continued to do the ‘M’ Technique stroking movements on his ‘arm’ and his whole body just let go and he slumped in the chair, totally relaxed. At the end of his treatment he said that the pain in his missing limb had gone. A little later in the day the Art Therapist went to work with him and he excitedly told her how the treatment had taken away the pain in his arm. The Aromatherapist continued to work with this young man and gave him another eight treatments, but by thethird session his phantom pains had disappeared completely. He did however suffer from severe itching as his wounds healed and he said that the massage helped to relieve his itching. He loved his treatments and would call the therapist over as soon as he saw her walk into the ward to ask if it was his turn. For the remainder of his treatments there was no longer a need to include the missing limb. More of Linda-Anne’s case studies can be found in the Summer 2013 issues of the International Journal of Professional Holistic Aromatherapy (IJPHA-Vol.2, Issue 1) To subscribe go to http://www.ijpha.com. This entry was posted in Aromatherapy, essential oils, Integrative Health, M Technique, Uncategorized and tagged Aromatherapy, aromatherapy in hospita, Burns, M technique, phatom limb, relaxation. Bookmark the permalink.